Ganglia and nuclei are two types of clusters in the nervous system that are made up of cell bodies of nerve cells. The nerve cell is the structural and the functional unit of the nervous system. The control center of a nerve cell is the cell body, which consists of the nucleus of the nerve cell. The cell bodies of the nerve cells are clustered together to form functional units. These functional units are present in both central nervous system (CNS) and peripheral nervous system (PNS). 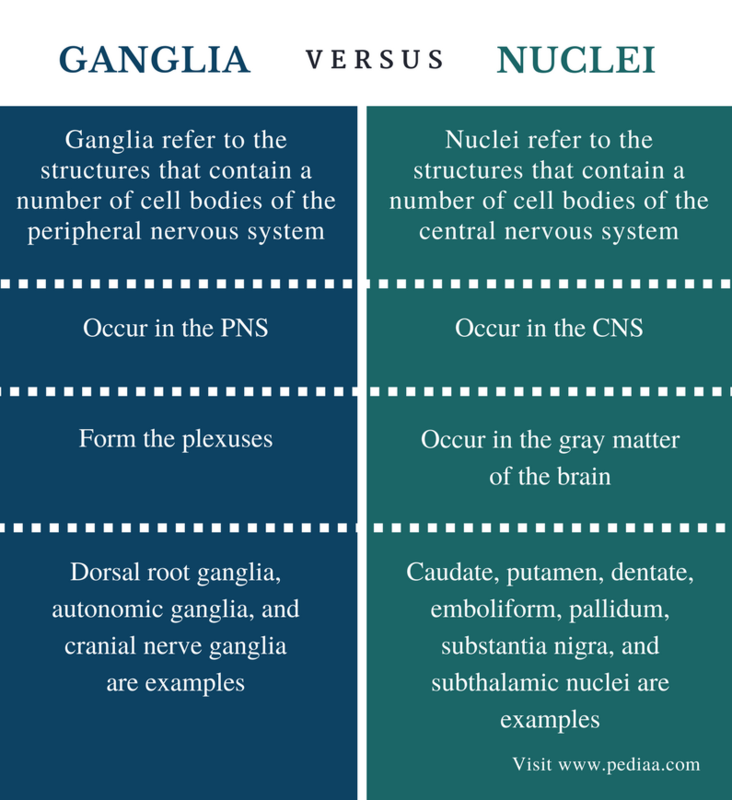 The main difference between ganglia and nuclei is that ganglia are clusters of nerve cell bodies in the PNS whereas nuclei are clusters of nerve cell bodies in the CNS. Ganglia refer to the clusters of nerve cell bodies in the peripheral nervous system (PNS). They can be found in animals higher animals above cnidarians. Generally, the cell bodies of motor neurons are found in the spinal cord. Only the cell bodies of sensory neurons can be found outside of the spinal cord. Therefore, all ganglia are made up of cell bodies of sensory neurons. Three types of ganglia are present in vertebrates; dorsal root ganglia, cranial nerve ganglia, and autonomic ganglia. The dorsal root ganglia consist of the cell bodies of afferent nerve fibers. The afferent nerve fibers carry sensory nerve impulses towards the central nervous system (CNS). 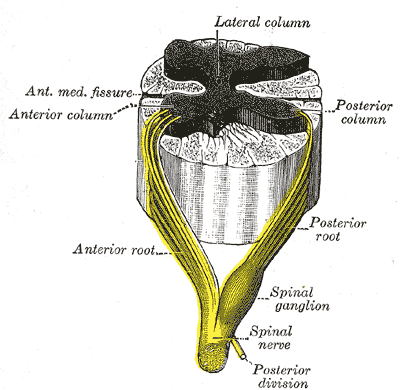 The dorsal root ganglia are also called the posterior root ganglia or spinal ganglia. The dorsal root ganglia are shown in figure 1. The cell bodies of sensory cranial nerves are arranged in the cranial nerve ganglia. 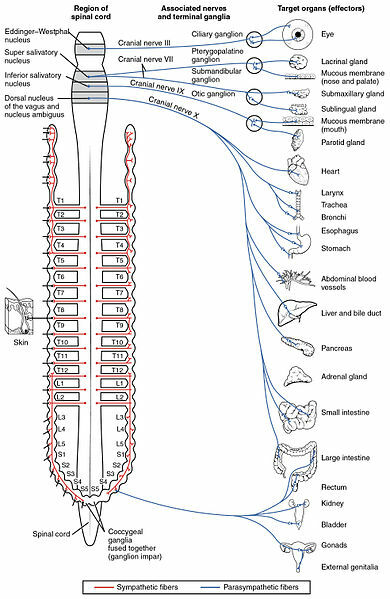 The cell bodies of sensory nerves of the autonomic nervous system are arranged into the autonomic ganglia. The autonomic ganglia consist of cell bodies of sensory nerves in both sympathetic and parasympathetic nervous system. The cranial and the autonomic ganglia are shown in figure 2. The term nuclei refer to the clusters of cell bodies in the central nervous system (CNS). They are located deep in the cerebral hemispheres and the brainstem. Nuclei are found in the gray matter of the brain. They are interconnected to each other by tracts. Tracts are bundles of axons, which extend from nuclei. Generally, the brain consists of hundreds of distinguishable nuclei. Inside the nucleus, multiple subnuclei can be identified, which are arranged as clumps. Both thalamus and hypothalamus are organized clusters of nuclei in the brain. 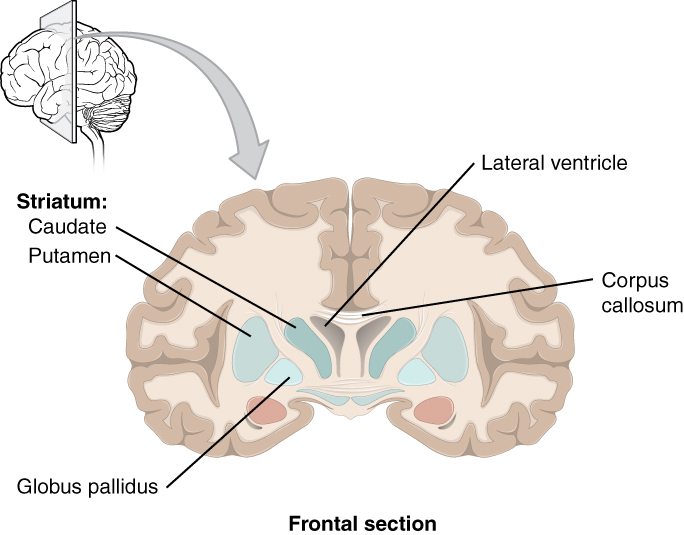 Basal nuclei are a group of interconnected nuclei of the cerebral cortex, thalamus, and the brainstem. Basal nuclei are sometimes called basal ganglia. The basal nuclei are composed of caudate, putamen, pallidum, substantia nigra, and subthalamic nuclei. The brain stem contains three nuclei called red nucleus, vestibular nucleus, and inferior olive. The cerebellum contains dentate nucleus, emboliform nucleus, globose nucleus, and fastigial nucleus. The basal nuclei of the front section of the brain are shown in figure 3. Both ganglia and nuclei are the clusters of the cell bodies of the nerve cells. Bundles of nerve fibers start from both ganglia and nuclei. Ganglia: Ganglia refer to the structures that contain a number of cell bodies of the peripheral nervous system. Nuclei: Nuclei refer to the structures that contain a number of cell bodies of the central nervous system. Ganglia: Ganglia occur in the PNS. Nuclei: Nuclei occur in the CNS. Ganglia: Ganglia form the plexuses. Nuclei: Nuclei occur in the gray matter of the brain. Ganglia: Dorsal root ganglia, autonomic ganglia, and cranial nerve ganglia are the examples of ganglia. Nuclei: Caudate, putamen, dentate, emboliform, pallidum, substantia nigra, and subthalamic nuclei are examples of nuclei. Ganglia and nuclei are clusters of nerve cell bodies. Ganglia are cell bodies of the sensory neurons in the PNS. They are arranged in the both sides of the spinal cord. Nuclei are the clusters of cell bodies of the nerve cells in the CNS. The cell bodies of both motor neurons and the sensory neurons form nuclei. The main difference between ganglia and nuclei is the type of cell bodies present in each type of clusters. 1. “Ganglion.” Encyclopædia Britannica, Encyclopædia Britannica, inc., 20 Aug. 2014, Available here. Accessed 12 Sept. 2017. 2. “Nucleus (Neuroanatomy).” Wikipedia, Wikimedia Foundation, 24 Aug. 2017, Available here. Accessed 12 Sept. 2017.